Everything you need to teach digital skills – no prior experience needed! 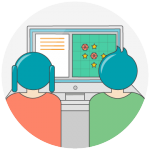 Bomberbot’s comprehensive lesson plans make teaching digital skills easy for everyone. Join a FREE trial today! Easy-to-use teaching materials packed with online and offline activities. An example of a lesson plan. Students get to practice learned concepts in an engaging way. Manage students, follow their progress and understanding of learned concepts. Our customer support is ready to help through phone, email and chat. Bomberbot’s 30 day trial gives you access to the first 4 Bomberbot lessons including presentations, lesson materials and game levels. Join now to try Bomberbot’s teaching tools at class! Get in touch – we are happy to help!